But it applies perfectly to osteoporosis too. The inevitable truth is that after a certain age, you start to lose more bone than you build (more on that in a moment.) But osteoporosis isn’t inevitable. If you look after your bones throughout your life, you’ll be prepared to offset the natural bone loss and prevent osteoporosis from stealing your independence in your best years. That’s why we’ve put together a list of eight things you can do to help prevent osteoporosis. And as your bone needs change throughout the different stages of your life, we’ve got specific information for children and teens, adults, and older adults where relevant. Even if you already have osteoporosis or osteopenia, there’s hope. You’ll find useful information here, and on the rest of our website, on how you can turn your bone health around. Did you know about 10% of your skeleton is rebuilt every year? It’s true! See, your bones are constantly being removed and replaced. It’s called the “bone remodeling process.” You have special cells that remove old, brittle bone– the osteoclasts, and you have special cells that build new, strong bone– the osteoblasts. Now, the natural bone remodeling process will continue to build new, healthy bone and increase your bone density until you reach peak density at about 40 years of age. At around 40 (generally speaking) the natural bone remodeling process becomes unbalanced. Your osteoclasts start to remove bone quicker than your osteoblasts can replace it. This leads to bone loss– you can expect to lose about 1% of your bone density every year from 40 onwards – and eventually osteoporosis. Family History: Genetics plays a role in osteoporosis risk. If osteoporosis runs in your family, keep reading for more information on how to prevent osteoporosis. Gender: Osteoporosis is more common in women than it is in men. One major reason is that during perimenopause, a woman’s hormone levels fluctuate and drop as she moves through menopause. This affects the natural bone remodeling process further. Women can lose 2% or more of their bone density every year during the menopausal transition and for the first five years postmenopause! Certain Diseases: Many diseases, like chronic kidney disease and certain cancers, can have a negative effect on your bones. You can find a more comprehensive list of diseases that cause bone loss here. For a more comprehensive list of factors that cause osteoporosis, check out our “Top Causes of Osteoporosis” page. The natural bone remodeling process becoming unbalanced sounds scary. But don’t worry, you can take steps to counterbalance the natural bone loss. You can actually boost the amount of healthy bone you build from childhood until the age where the bone remodeling becomes unbalanced. This extra bone effectively creates a “bone savings account.” Then, if you do start to lose bone, you can dip into the account and preserve your healthy bone density. In fact, research suggests a 10% increase in peak bone mass in children reduces the risk of an osteoporotic fracture during adult life by 50%! And it’s not just about building a bone savings account before age 40 that you can dip into for the rest of your life. If you continue to implement these osteoporosis preventions, you’ll help your body to build more bone than you lose. Yes, you can actually offset the 1% loss from the natural bone remodeling! So, here are eight ways to prevent osteoporosis, with specific advice for each stage of life where relevant. As you’ll soon discover, there are several factors that can help you prevent osteoporosis. But perhaps the most important of all is your diet. See, to build healthy, strong bones, you need to supply your body with the raw building blocks. After all, what better way to prevent osteoporosis than to continually build new bone? Preventing osteoporosis isn’t just about including the right foods in your diet though. You need to avoid certain foods that cause bone loss too. Unfortunately, the Standard American Diet (SAD) is very pro-inflammatory. That means, on average, Americans are consuming far too many foods that cause inflammation in the body. Inflammation is actually part of your body’s immune response. Inflammatory cells are your body’s first response team to help heal injured tissue or eliminate harmful substances. But here’s the thing; consuming too many pro-inflammatory foods causes the inflammation to become chronic. And chronic inflammation is very bad news indeed. In fact, research suggests chronic inflammation plays a role in a whole host of diseases, including osteoporosis. As far as osteoporosis is concerned, chronic inflammation overstimulates your osteoclast cells (remember, they’re the cells that break down your bones.) To discover more about inflammation and bone health, and a list of pro-inflammatory foods to avoid, check out our “8 Foods To Avoid For Osteoporosis” post. You already knew this one though, right? Calcium is the cornerstone of bone health after all! Magnesium works alongside calcium in many of your body’s cellular activities. Plus, magnesium deficiency is linked to bone loss! Vitamin D (in its active 1,25-D form) helps you absorb the calcium you consume. In fact, if you don’t get enough vitamin D, you’ll only absorb about 10-15% of the calcium you consume! There’s currently no set recommended dietary allowance for vitamin K2, but research suggests 90 mcg a day could be enough to benefit bone health. Did you know 50% of bone volume is protein? It’s true! Protein provides the structural matrix of your bones. But you may have heard protein increases the amount of calcium your body excretes. So, is protein an important part of your bone health? You bet! See, like a lot of things in life, especially where your bones are concerned, it’s all about balance. Calcium and protein work together to increase your bone density and make your bones strong. Here’s the important thing to remember about protein though; you need to get adequate amounts of both protein and calcium. Research shows higher protein diets are associated with greater bone mass and fewer fractures when calcium intake is adequate! But if you don’t get enough of either one, that’s when you can see an increase in calcium excretion. To discover exactly how much protein you need, plus some additional benefits of protein and the top dietary sources, check out our “Everything You Need To Know About Protein and Bone Health” post. But here’s the thing; it’s not easy to get enough of the nutrients your bones need from your diet alone. Especially as you get older. Our “Osteoporosis Diet and Nutrition” page provides in-depth information on all the nutrients listed above, plus advice on which foods you need in your diet to support healthy bones. As you can see, the recommended dietary allowance (RDA) for most bone-supporting nutrients increases for older adults. But a lot of people experience a decline in appetite as they age, which makes consuming enough of the key nutrients to prevent osteoporosis a challenge. What’s more, destructive modern farming and agricultural practices tend to focus on quantity above quality. As a result, our topsoil is becoming less capable of holding moisture and trace minerals. So even the foods you think are providing enough bone-supporting nutrients could be shortchanging you. A study in the Journal of the American College of Nutrition compared the nutritional data of 43 fruits and vegetables from 1950 and 1996. They found that the crops had suffered “statistically reliable declines” in protein, calcium, phosphorus, iron, riboflavin, and vitamin C over the years. Taking a supplement is the easiest, most convenient way to ensure you’re getting enough of the key nutrients you need to promote healthy bones, and even grow new bone. AlgaeCal Plus is a calcium supplement that provides ALL 13 bone-supporting nutrients. Yes, that’s all 13 nutrients you need for strong bones and bone growth in one supplement! When researchers gave AlgaeCal Plus to a group of women over 40, they saw a first in human history: a calcium supplement actually increased bone density! And it increased by 1.3% on average in just 12 months. Remember, what better way to prevent osteoporosis than to build new bone? And speaking of building new bone, when you take Strontium Boost along with AlgaeCal Plus (we call it our Bone Builder Pack), you’re guaranteed to see increased bone density at every follow-up DEXA scan you have while you’re taking the two. AlgaeCal Plus is 100% natural, side-effect-free, and safe. But for children and teens up to 18-years-old, we created a more tailored supplement called AlgaeCal Basic. See, children and teens don’t need quite as much of some of the vitamins and minerals in AlgaeCal Plus — like magnesium for example — as adults do. So AlgaeCal Basic provides all 13 essential bone-supporting minerals, just like AlgaeCal plus. But in AlgaeCal Basic, they’re provided in amounts that support healthy bone development in children and teens specifically. Discover more about AlgaeCal Basic by clicking here. Just as you saw with food, the drink (specifically the alcoholic kind) in your diet plays a role in preventing osteoporosis. And you may be happy to hear that cutting alcohol out altogether isn’t the most beneficial option for your bone health. We’ll cover alcohol in just a moment, but first, let’s take a quick look at how smoking affects your bones. Cigarettes negatively affect the way your body uses vitamin D. And vitamin D is crucial for absorbing calcium, the cornerstone of bone health! Smoking lowers your levels of estrogen, which is a vital component of the bone remodeling process. Cigarettes contain harmful toxins like cadmium that cause bone loss. If you really want to give yourself the best chance of preventing osteoporosis, the cigarettes have to go. 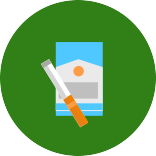 For those who need a helping hand to quit smoking, The National Cancer Institute’s smokefree.gov initiative is a great resource for tips and advice. But if you really can’t quit, we’ve put together a list of nutrients you need to incorporate in your diet to limit the damage cigarette toxins are causing your body and bones. You can find it in the “Environmental Toxins: endocrine disruptors and smoking” section here. Secondhand smoke can still affect the bones and overall health of non-smokers. Especially children. A study on young rats found that exposure to secondhand tobacco smoke significantly compromises bone health. Rats who were exposed to the secondhand smoke of four cigarettes a day for 60 days experienced a 41.5% decrease in bone mineral density compared to a control group of rats who weren’t exposed to any secondhand smoke. This lead to a 42.8% reduction in maximum strength. What’s more, the tibia (shin) bone of the rats exposed to 60 days of secondhand smoke was 41.5% shorter compared to the control group of rats! This suggests exposure to secondhand smoke interferes with bone development. Please note: At AlgaeCal we strive to present you with the latest, highest-standard research and studies. And that usually doesn’t include animal studies. But human intervention studies should never be carried out if the risks outweigh the potential benefits of the information they reveal. This study is a prime example. Exposing children to secondhand smoke isn’t ethical. It boils down to two things when it comes to alcohol; moderation and type. 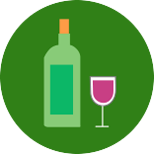 See, the occasional glass of red wine with dinner or a bottle of beer after a long day aren’t just tolerable; these types of alcohol can actually have a positive effect on your bone health! (You can read about the hows and whys on our “Osteoporosis Diet and Nutrition” page). But when you consume too much alcohol– about 2 to 3 ounces a day –the benefits tail off and your bones start to suffer. Research suggests consuming too much alcohol can lead to excess calcium loss, and reduced levels of vitamin D. (Remember, you need vitamin D to be able to absorb the calcium you consume). Healthy women of all ages and men older than 65 can enjoy up to one drink a day. While healthy men younger than 65 can enjoy up to two drinks a day. But more often than not, these recommendations are too late. See, by the time you qualify to be recommended for a DEXA scan, you could already have osteoporosis. So starting to consider your bone health at this point is like starting to save for your retirement the day you retire! To give yourself the best chance of preventing osteoporosis, it’s a good idea to request a DEXA scan earlier than the recommended age. This will give you the opportunity to see the current state of your bone health, and take further preventative measures if your scan shows your bone health is declining. All before osteoporosis rears its ugly head. Now, medical insurance providers will typically only cover the cost of a DEXA scan once every two years if any of the bullet points above describe you. Insurers may cover the cost of an early DEXA scan though if your doctor deems it medically necessary. So discuss your concerns with your doctor and explain why you want an early DEXA scan. Be sure to mention any medications you may take that could contribute to osteoporosis (we’ll cover more on these in just a moment), your family history of osteoporosis if it’s relevant, and any fractures or broken bones you’ve suffered. If your doctor can’t convince your medical insurance provider to cover the cost of an early DEXA scan, you can still pay for one yourself. The price of a DEXA scan varies depending on where you get it, and your personal case, but you can expect to pay between $50-$300. That’s not cheap, but it’s important to weigh the costs against the benefits. If your scan results show your bones are in fine health, it’s a small price to pay for the peace of mind that you can carry on as you are, not needing to worry about osteoporosis. And if your scan results show your bone health is in decline, the price of the scan is well worth it for the opportunity to nip osteoporosis in the bud. You won’t end up seeing them, but you’ll be glad you avoided the extra costs and stress that would have occurred further down the line! 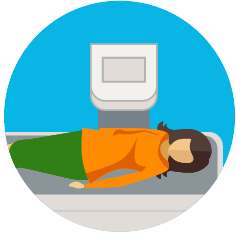 If you want to read a little more about DEXA scans, visit our “Everything You Need To Know About a DEXA Scan” page. Your hormones play an important role in processes all over your body. That includes reproduction, metabolism, and the natural bone remodeling process we outlined earlier. Estrogen, progesterone, and testosterone, in particular, need to be in balance to keep the natural bone remodeling process in check. Plus, your thyroid hormones (secreted by your thyroid) can also affect your bones if levels become unbalanced. (You can read more detail about how each hormone affects your bones on our “Top 6 Causes of Osteoporosis” page). A hormonal imbalance during childhood can affect the growth and development of a child’s entire body, including the bones. If a child seems particularly early, or late, to start puberty, it could signify an underlying hormone imbalance. As well as estrogen, testosterone, progesterone, and thyroid hormones, growth hormone levels are especially important for children, too. If you’re concerned about your child’s hormone levels, it’s always best to consult a pediatric endocrinologist. You may know menopause drastically affects the levels and production of a woman’s hormones, particularly estrogen. And that can cause an unbalanced bone remodeling cycle, which leads to bone loss. Now, menopause generally occurs when a woman is between her late 40s and early 50s, but it can start earlier. If you experience any of the symptoms above before age 40, and they can’t be explained by another cause, discuss your situation with your doctor. Your doctor may order a blood test to check your levels of follicle-stimulating hormone and estrogen. This will help determine that you are experiencing early menopause and not another underlying health issue. Women who are experiencing early menopause, or are interested in more information about early and regular menopause may find our “Ultimate Guide to Menopause and its Effect on Your Bones” post useful. Women generally experience menopause somewhere between their late 40s and their early 50s. During menopause, your levels of estrogen fluctuate wildly (this is actually what causes some menopause symptoms like hot flashes). And in your postmenopausal years, your production of estrogen is lower. A low level of estrogen can cause your osteoclasts to go into overdrive, AND increase the number of places on your bone the bone remodeling happens. Left unchecked, that’s a one-way ticket to osteoporosis. So what can you do to protect your bones? Well, bio-identical hormone therapy treatment (BHRT), exercise, and adjusting your diet are all key factors to bring the hormonal changes menopause causes back under control. You can find information on all three, plus more in-depth detail on menopause and osteoporosis in our “Ultimate Guide to Menopause and its Effect On Your Bones” post. It’s true that osteoporosis is more common in women than men. But a man’s natural bone remodeling process will still start to remove more bone than it builds as he ages. It’s just that men have larger, denser bones to begin with, so they can withstand more bone loss than women without becoming osteoporotic. Just as there are with women, there are several factors that can accelerate a man’s bone loss though. And one of those factors is andropause. Andropause is often described as the “male menopause,” but it generally starts later than a woman’s menopause and occurs more gradually. During andropause, a man’s levels of testosterone start to dip. This has damaging effects on bone because men with normal levels of testosterone will convert a small amount to a form of estrogen, which is crucial for maintaining bone health. It’s important to note that age-related andropause isn’t the only cause of lower testosterone production in men. Obesity, environmental toxins, and conditions like hypogonadism can all affect testosterone production, and promote bone loss too. Like you saw with estrogen in postmenopausal women, testosterone deficiency in men can be treated with hormone replacement. Again, testosterone replacement therapy must be administered through your doctor. There are several methods to choose from, and some may be more beneficial depending on your personal circumstances. Some doctors are closed to the idea of hormone replacement, so you may need to find one who is more involved in anti-aging medicine. While testosterone deficiency is a cause of osteoporosis in men, there are more common causes. You can find more information by visiting our “Top 6 Causes of Osteoporosis” page. When you’re stressed, your body releases a hormone called cortisol. And this “stress hormone” is bad news for your bones. Prolonged stress keeps your levels of cortisol high, and this causes inflammation in your body. Now, if this inflammation persists it becomes chronic, low-grade inflammation. And this chronic inflammation can cause bone loss and osteoporosis. Remember, chronic inflammation activates your osteoclasts (the cells that remove bone) and skews the bone remodeling process! What’s more, stress affects your liver. Specifically your hypothalamic-pituitary-adrenal axis. You may be wondering “What does my liver have to do with my bones?” Well, your liver is actually a powerful bone health ally! We’ve already mentioned that the active form of vitamin D (1,25-D) helps you absorb the calcium you consume. Well, the conversion of vitamin D to this active form takes place in your kidneys. But before that happens, vitamin D3 must be converted to 25(OH) D in your liver! Plus, one of your livers’ primary roles is to help your body remove harmful toxins. And this includes toxins that can harm your bones. But when you become stressed, your liver becomes inflamed, and its ability to properly detoxify your body is impaired. Enjoy yourself! Don’t you just feel better when you’re around friends and loved ones? Laughing and enjoying yourself is a proven way to reduce stress. A study on the effect of laughter on stress levels in healthy adults confirms it! Participants who viewed a humorous video reported higher humor levels and lower stress levels compared to participants who viewed a tourism video. What’s more, those that reported the highest humor levels even showed increased immune function! Try yoga: Yoga helps relax your body and mind. Plus, yoga can help strengthen your bones in its own right! Check out our “Ultimate Guide to Yoga For Osteoporosis” if you’re interested in giving it a go! Get Moving: Yoga isn’t the only exercise that helps reduce stress. In fact, just about any activity that gets your heart beating that little bit quicker can help burn stress (as well as calories.) A Dutch study on twins and their families found that those who exercised at least 60 minutes a week were, on average, less anxious, less depressed, and less neurotic compared to those that didn’t exercise at all. If you’re still not convinced enough to make time for regular exercise, check out the next section! It’s true! Exercise is a crucial component of your general well-being at every stage of your life, and it’s extremely important for keeping your bones strong and dense. And that’s especially true for weight-bearing exercise like running, dancing, and weight training. Remember the “bone bank account” we mentioned earlier? If you build enough bone in your younger years, you’ll be able to “withdraw” from the account when your natural bone remodeling process starts removing more bone than it builds. Well, exercising during childhood and teen years is a great way to kickstart your bone bank account. That’s because the skeleton is still developing in this life stage, and exercising can help it to reach its full potential. A study published in the American Academy of Pediatrics found that 40 minutes of moderately intense exercise a day increased bone mass in children significantly more compared to 60 minutes of exercise a week. The intervention group: 446 boys and 362 girls who performed 40 minutes of exercise a day during “physical education” class. The control group: 807 boys and 780 girls who performed 60 minutes of exercise a week during “physical education” class. A subsample of 73 boys and 48 girls from the intervention group and 52 boys and 48 girls from the control group had their bone mineral content and bone width recorded by a dual-energy radiograph absorptiometry (DEXA) scan, too. The average annual gain in lumbar spine bone mineral content was 7.0% higher in girls and 3.3% higher in boys with the daily exercise, compared to the control group with weekly exercise. And the average annual gain in femoral neck width was 1.7% higher in girls and 0.6% higher in boys in the daily group compared to those in the weekly group. The Centers for Disease Control and Prevention recommends children and adolescents get an hour of physical activity every day. That may sound like a lot, but remember, children are very energetic! Dashing around the schoolyard, playing jump rope, and walking to school all contribute towards that hour of physical activity. Now, as we mentioned a little earlier, the most important type of exercise for building strong bones and preventing osteoporosis later in life is weight-bearing exercise. That’s basically any exercise that forces you to work against gravity, like running, jumping, or dancing. So make sure your children’s daily hour of exercise includes some weight-bearing activities. When your natural bone remodeling process starts to remove more bone than it builds (around age 40), weight-bearing exercise is crucial for tipping the bone scales back in your favor. Now, as you’ll discover in our “Can Exercise ALONE Increase Bone Density?” post, exercise alone can’t increase your bone density. But it is an important factor in keeping your bones strong and healthy and preventing osteoporosis. The Centers for Disease Control and Prevention recommends adults (19-64) get 2 hours and 30 minutes of moderate-intensity aerobic exercise, and at least 2 sessions of muscle-strengthening exercises a week. Aerobic exercise can include anything that gets your heart beating faster than usual, like walking, dancing, and even gardening. But remember, weight-bearing exercise is the best kind of exercise for your bones. So try to include this kind of exercise in your weekly routine over exercise that doesn’t bear weight, like swimming. And muscle-strengthening is pretty straightforward. Anything that strengthens your muscles! So resistance band exercises, weight training, and push-ups for example. You can find a whole host of anti-osteoporosis exercise ideas along with video tutorials in the exercise section of our blog. As you age, unless you actively combat it, your muscle mass will be gradually lost and replaced with fat. The technical term for this is sarcopenia. The amount of muscle loss varies from person to person, but recent research suggests the average rate for people over 70 is 0.5-1% per year. Having less muscle means you become weaker, and your balance becomes affected. This significantly increases the risk of a fall and related fracture. But just like osteoporosis, sarcopenia is NOT an inevitable outcome. And exercise, particularly weight-bearing exercise, is a key component of combating sarcopenia and maintaining healthy bones. You can read more about how exercise combats sarcopenia in our “Can Exercise ALONE Increase Bone Density?” post. The Centers for Disease Control and Prevention recommends older adults (64+) ideally get 5 hours of moderate-intensity aerobic exercise, and at least 2 sessions of muscle-strengthening exercises a week. Research shows sleep quality not only plays a role in bone health but could be directly associated with osteoporosis! After all, the time you spend asleep is the time your body grows and repairs. Check out the sections below for information on how sleep affects bone health at each life stage. And visit our “6 Natural Sleep Aids That Actually Work” page for a few suggestions on improving your sleep too! All parents know how important a good night’s sleep is to their children’s health and development. And research shows that extends to bone health. The results showed that the children who got the most sleep had significantly greater BMC. Now, the older children would be expected to have greater BMC than the younger children. After all, they would have had longer to build their bone. But when the children were separated into age ranges (seven years old and younger, and above seven years old) those that slept longer still had higher BMC than those who slept for a shorter duration. The bonus bone effects of napping: A somewhat surprising result from the study above was that daytime napping had a significant, positive correlation with BMC. So napping is good for more than a few minutes of peace and quiet! Modern life makes getting enough sleep as an adult a tricky endeavor. Early rises, work commutes, and life commitments all interfere with the time you should be getting some rest. It may be true that sleep isn’t as vital from a developmental standpoint in your adult life compared to childhood, but it’s still very important. And sleep is still a factor in preventing osteoporosis in adulthood. A 2016 study researched the impact of sleep on osteoporosis in adults. One thousand and thirty-two participants aged 25 to 85 took part. The bone stiffness index (SI), a marker of osteoporosis, was measured in each participant using ultrasounds. 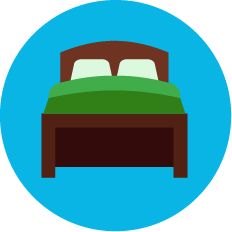 And their sleep habits, including the time they went to bed, the time they spent in bed, and the quality of their sleep were assessed using the Pittsburgh Sleep Quality Index (PSQI). The study found that sleep disturbances were significantly associated with SI in each category of PSQI. In other words, poor sleep and sleeping habits have a negative impact on bone health! As for the ideal amount of sleep for adults, the current recommendation is set at 7 to 9 hours for 18 to 64 year-olds. As people age, there’s a tendency to go to bed earlier and wake earlier. This could actually be attributed to a shift in circadian rhythm– essentially your body clock. That’s not a problem, as long as you’re getting enough sleep. See, sleep becomes especially important again in later life. If you aren’t getting enough sleep, you’ll feel groggy and unfocused, which can increase your risk of a fall. And, as we’ve seen with the other life stages, sleep is still an important factor for preventing osteoporosis in later life. A study published in the Journal of American Geriatrics Society examined the relationship between sleep duration and osteoporosis in older adults. Five thousand, two hundred and eighty-eight men and women aged 50 and over participated. Their osteoporosis diagnosis was measured with a bone mineral density scan, and their sleep duration was recorded with a sleep survey. The results? Sleeping less than six hours a night was significantly associated with osteoporosis. The recommended amount of sleep for older adults (65+) is 7 to 8 hours a night. Sleep disorders are a common problem among older adults, particularly insomnia. Studies have found that 23 to 34% of adults aged 65 and over in America suffer from insomnia. If you have trouble sleeping, check out our natural sleep aid suggestions on our “6 Natural Sleep Aids That Actually Work” page. You may be surprised to learn some of the most common prescription medications can contribute to bone loss and even osteoporosis. Now, it’s important to note that your doctor does care about your health. They prescribe you certain medications because they want to help you manage the condition you’re facing. But unfortunately, your bone health and preventing osteoporosis aren’t always a priority. You can find a list of drugs that cause osteoporosis by clicking here. If you’re currently taking one of these drugs, or are concerned about another prescription drug (the list provided isn’t exhaustive) we highly recommend discussing your situation with your doctor. Let them know you’re worried about your bone health and see if there’s an alternative option that doesn’t lead to osteoporosis. If taking the medication is unavoidable, don’t panic. You just need to pay extra close attention to the points we’ve outlined on this page. Especially your diet. Remember, feeding your body the materials it needs to build healthy, new bone is one of the most effective ways to prevent (and even reverse) osteoporosis. 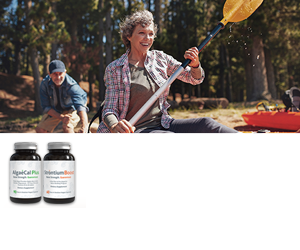 And as we outlined earlier, supplementing with AlgaeCal Plus and Strontium Boost (our Bone Builder Pack) is the most convenient way to ensure you’re getting all the nutrients you need, and to guarantee improved bone density. Plus, in most cases, AlgaeCal Plus and Strontium Boost are completely safe to take alongside any other medications you may be taking. Of course, it’s always best to double check with your doctor. No matter your gender, your age, or your genetics, you can keep your bones healthy and strong throughout your life and maintain your independence in your golden years. But you have to give your bones a helping hand. Follow the eight guidelines we’ve provided above, and you’ll successfully prevent osteoporosis… and even return to healthy bone density if you already have osteoporosis! And remember, it’s never too early to start looking after your bones.